You'll love this gorgeous selection of girly-girl Zebra Backpacks. You'll carry stuff in comfort and your hands will be free to explore or keep small children safely in check. I always picture myself exploring the world with these little tiny purses that hold a lipstick and a few credit cards. Well that's not the way it works in this family. My husband has a little wallet in his pocket - and that's all he needs. Well, quite frankly that's all he needs because he keeps handing me stuff. Pretty soon my purse is bulging and my back and arms are aching. Once when I dared to suggest that he carry my oh-so-cute zebra print hobo bag, a curious look of disbelief crossed his mind. He even dared say, "Hey Digby, if you didn't carry such a big purse you wouldn't have this problem." Only the thought of having a huge fight on a busy city street kept me from emptying out my purse and showing him that it was mostly his stuff that was causing the problem. Well I decided that I either had to get a new stuff carrying strategy - or a new husband. Since I'm really crazy about the hubby, I began to look for new purse styles. To my amazement I found a wonderful assortment of totally cute and feminine zebra backpacks. Many have wonderful embellishments such as bows. This is the zebra backpack that saved the day. 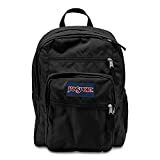 The first thing that you have to realize is that this isn't a huge and strong backpack that you're going to take camping or stuff with school books. This is a totally, adorable, and very cute purse that happens to be carried on your back. And don't you just love the purple bow across the back and the purple accent at the side. 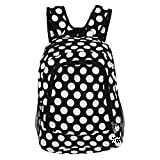 Don't worry, if you need a workhorse zebra bookbag, that will get you to your classes and the library you can still be a stylish fashionista on-the-go. I just love the fact that zebra print bookbags can perk up a wardrobe, with no effort. Up late and late for class because of it, a pink t-shirt, jeans and a zebra bookbag, will get you ready in a flash. Are you noticing a trend? Yes, I bet your eyes have picked up the wonderful color accents on most of these zebra print back packs. Now look to the right and see a hot pink zebra backpack where the stripes are pink and black. Very chic. Very cool. Use it as a purse or backpack your choice. 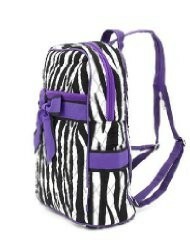 So get your zebra groove in gear and rev up your wardrobe with a zebra backpack. And hey did you notice the Amazon prices? Very good bargains to be found.